Online information propagates differently on the web, some of which can be viral. In this paper, first we introduce a simple standard deviation sigma levels based Tweet volume breakout definition, then we proceed to determine patterns of re-tweet network measures to predict whether a hashtag volume will breakout or not. We also developed a visualization tool to help trace the evolution of hashtag volumes, their underlying networks and both local and global network measures. We trained a random forest tree classifier to identify effective network measures for predicting hashtag volume breakouts. 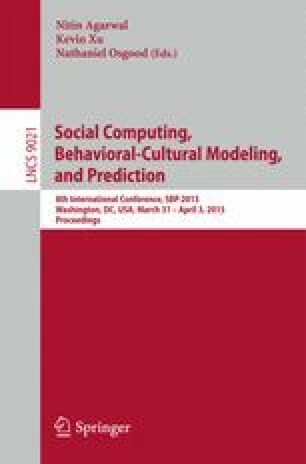 Our experiments showed that “local” network features, based on a fixed-sized sliding window, have an overall predictive accuracy of 76 %, where as, when we incorporate “global” features that utilize all interactions up to the current period, then the overall predictive accuracy of a sliding window based breakout predictor jumps to 83 %.